I saw some really adorable Christmas meringues on Pinterest and wanted to try my hand at one. I had never made meringues before, but they looked so fluffy and festive that I just had to have one! 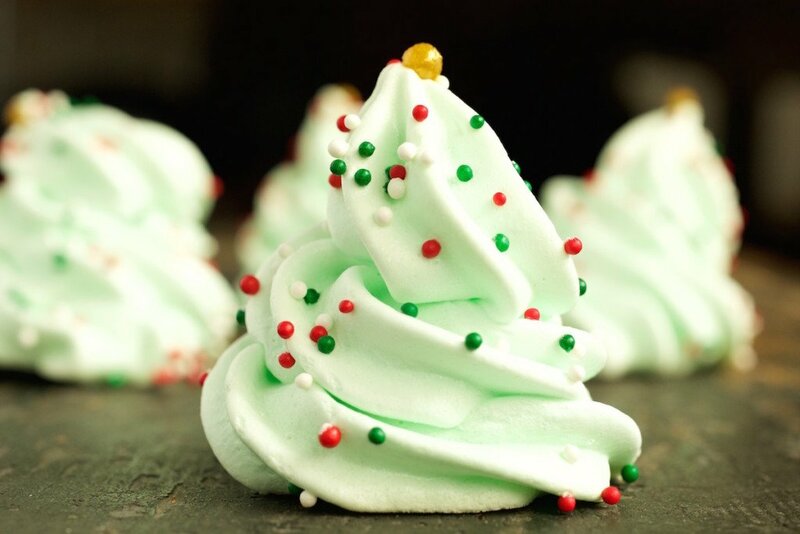 These Christmas Tree Meringues are surprisingly easy to make. It’s essentially just whipped egg whites and sugar. Sounds like my kind of dessert! The only “special tool” you might need is either a decorating tool (I use the Wilton Decorator Pro), or a disposable icing bag. I decorated my Christmas Tree Meringues with some red, green, and white Christmas sprinkles I already had and used Wilton’s Golden Sugar Pearls for the toppers. Feel free to get creative with the decorating and use whatever you have. I think it would be adorable to use snowflake sprinkles as the toppers. If you switch it up and do something different, I’d love to hear about it! Cover a baking sheet with non-stick spray, or use a slip mat. Use a stand mixer to whip the egg whites for a few minutes, until they are frothy. Gradually add in the sugar, then the cream of tartar, then vanilla and mint. Now add in green food coloring until you have reached your desired shade. Cover with Christmas sprinkles and place golden pearl on top. Bake for 45 minutes, or until edges have started to turn slightly brown. Eat immediately or store in an airtight container for up to 1 day. 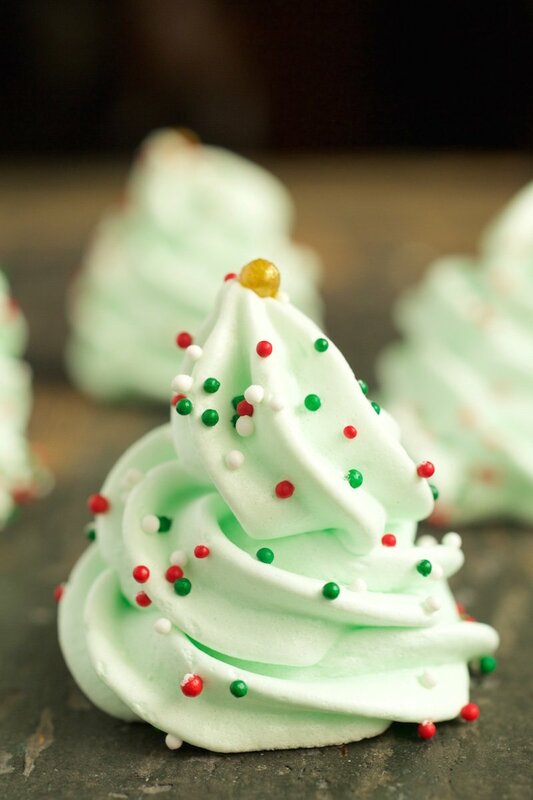 I used to make meringues all the time, though I haven’t for ages – but plain ones, neither mint nor Christmas trees! Plains ones are good enough, mint is a great idea! Meringues are one of my favorite cookies – I love these for the holidays! !